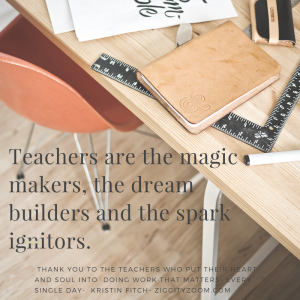 Teachers- you are amazing. Day in and day out you take a group of 20 or 30 children and move them forward. You are expected to teach, educate, excite, test and discipline each of your students. You are expected to keep the class and each student moving forward with their progress and maintain order and processes in place at all times. Thank you for everything you do. For bringing your love, and passion, and kindness to your classroom each and every day. For encourage little minds and hearts, for teaching math and science, but more importantly, for teaching kids about being good citizens and neighborly to their classmates. For keeping the peace, and working with kids to embrace each other’s differences in a world that needs that more than ever.